Graffiti might look cool across a canvas but it is less appealing when you find it on your walls. This type of vandalism is simple and quick to apply but terribly difficult to remove. When you are hit with a large design or a small tag, trust our Gorillas to get rid of it for you. A proper Wetaskiwin graffiti removal can take an unsightly stain and make it disappear completely. Where Does Graffiti Come From ? All across Canada, graffiti culture has grown with each passing year. The more mainstream it is in larger cities, the more it pops up in small communities. For larger areas, there are services around every corner but our Gorillas stay close to home. 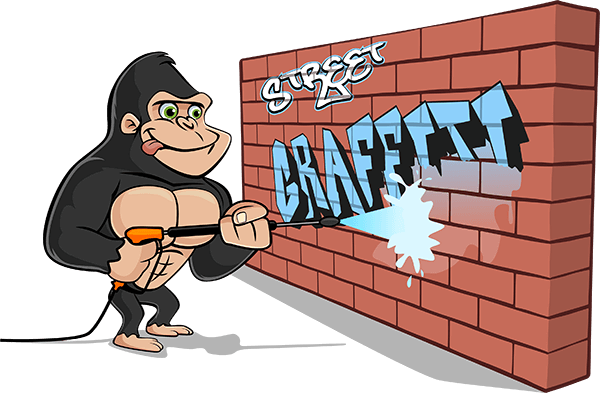 Our Gorilla technicians are local to your area and know the trials that graffiti puts on your space. There is hardly a department or hardware store that does not sell spray paint in one form or another. This gives way to convenience for graffiti artists all over. Blank walls or garage doors act as canvases for these street vandals but they are not the only areas that get hit. Graffiti artists do not discriminate between residential or commercial properties and are willing to leave their mark just about anywhere. Luckily, our Wetaskiwin graffiti removal covers any and all property types. These paints are sprayed out in small droplets that stick into the pores and grooves of your property’s outer areas. This makes removal 1even more difficult on uneven surfaces like stucco or concrete. By first applying an eco-friendly cleaning solution, surface staining is pulled away from materials and brushed away. Once this is done, less obvious stains can be dealt with on their own. In addition to the initial stain, graffiti leaves behind overspray, paint bleeding and shadowing. When you call a Gorilla, you are gaining both technical and real-world experience that knows how to get every trace of paint gone.